Despite the freezing cold temps, I’ve been craving lots of smoothies. 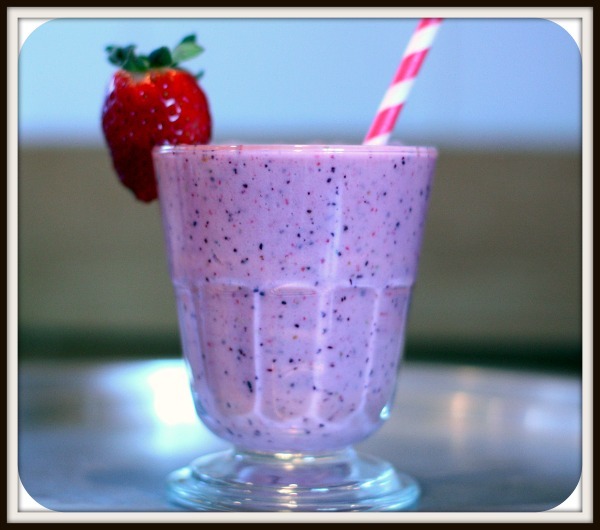 There’s something clean and refreshing about a smoothie. You wanna know something weird though… when I drink a smoothie for breakfast, I drink a cup of coffee too. See, weird. Anyone else do that? Or am I solo on this one? Despite my weirdness, this smoothie is perfect. It also makes for a great kiddie snack too! Throw everything in a blender and blend away 🙂 If you’re using all fresh fruit, add a handful of ice cubes to make it nice a slushy. 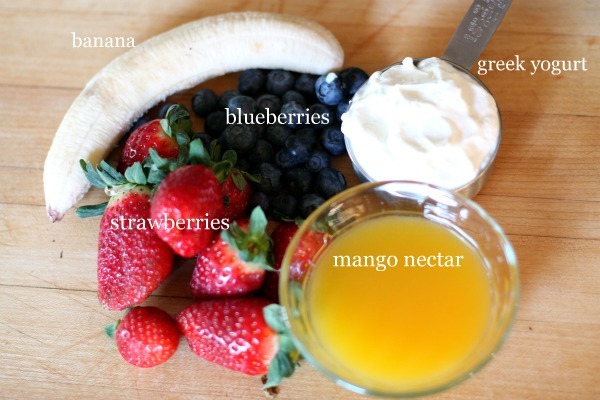 You can also change up the flavors of this smoothie by switching out different fruits or a different flavor nectar. Someone else enjoyed the smoothie too…. 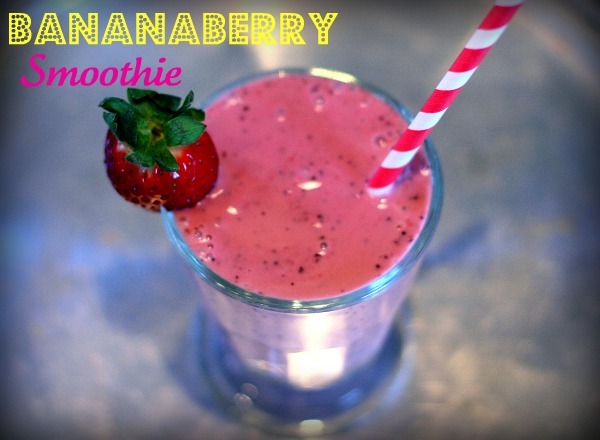 i would definitely love this smoothie…it sounds heavenly! I have been craving ice cream, but have not given in since it has been so cold and I am wearing enough layers that I feel like the stay puff marshmallow man. I may have to give in while sitting by the fire! This looks delicious! Seriously these pictures of M look SO grown up! It’s like she just matured an entire year before my eyes. So cute! I know! I can’t believe how big she is either! It amazes me that she’s my kid. I drink coffee or tea with smoothies too. Oh, and if I make one in the afternoon (or a protein drink,) I have a cup of hot water with it! I never drink smoothies in the winter, but in the summer when I drink them I DEFINITELY still have coffee!! I love that stripey straw! Is it re-usable like the steel one? The photos alone make me want to try this smoothie. Your daughter is so precious and beautiful! I used fresh papaya, frozen banana, kiwi, ice and some almond breeze. I have coffee no matter what I have for breakfast! 🙂 Smoothies are the highlight of my little one’s day, too. This one looks tasty! Yum! I don’t know who wouldn’t love a good, thick smoothie. doeesn’t that look absolutely amazing! But it is WAY to cold here for smoothies. I still have a frozen one in my freezer…I should just have it this week or it will be there until spring! I am in a smoothie mood, too! And I’m with you…even with a smoothie, I need my coffee 🙂 It makes for a morning with a lot of bathroom trips! LOL! Ooh yum. Your first photo is so bright and summery. I love it! This looks delicious! Where can I find the mango nectar? We are big into smoothies here- mostly for snacks. Your photos are amazing. Did you learn on your own, take classes? Thanks Melanie, thats so sweet of you! What brand of mango nectar did you use? Use these same ingredients and substitute spinach in place of the yogurt. I promise it’s good! I use all frozen fruit and frozen bananas (let ripen, peel and freeze). Oh, I have coffee with my smoothie too! Hi just thought i’d tell you something.. It is twice now i?ve landed on your blog in the last 3 weeks looking for completely unrelated issues. Fantastic Information! Maintain up the very good do the job.